And that is that for today's live. Thanks as always for all your comments and we loved your pictures of old beautiful cars. We will be up and running with our live page at 10.30 BST on Saturday before the third practice session starts at 11:00 BST. Look forward to seeing you all again then. Bye for now. You've seen two practice sessions so now predict the top three at the Singapore Grand Prix. Ferrari's Kimi Raikkonen led Lewis Hamilton's Mercedes by just 0.011 seconds in second practice at the Singapore Grand Prix. Hamilton's title rival Sebastian Vettel was ninth after hitting the wall and damaging his car's right rear corner. Your reaction to the 2021 cars / What are the best looking F1 cars in history? Sebastian Vettel could only manage 11 laps as he went into the wall, but his team-mate (well, until the end of the season) Kimi Raikkonen is the fastest man out there thanks to a 1:38.699. 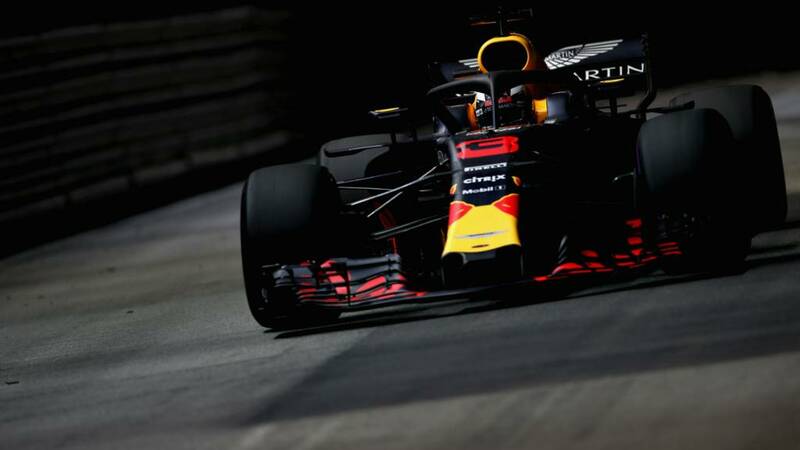 Lewis Hamilton is second quickest with a 1:38.710 and Max Verstappen leads the Red Bulls in third with Daniel Ricciardo fourth. Well played Fernando for keeping his cool. A spin for Marcus Ericsson, who is 12th quickest. He is almost hit by Fernando Alonso, who does extremely well to avoid the Swede. Ericsson had a massive crash in Italian Grand Prix practice, and nearly had another one then. No more of Sebastian Vettel today as Ferrari continue to work on his damaged car. We started the day discussing Kimi Raikkonen and will end it with him being top of the times in session two as the drivers are on their long runs. A problem for Max Verstappen as well. Verstappen is third with Ricciardo fourth after a one-two earlier in the day. Verstappen is asked "what happened?" He replies: "It happened out of Turn Seven, I accelerated and I don't know it is misfiring or something." Lance Stroll's brakes are on fire. He immediately gets the call. "Brakes are too hot, slow as you can to cool the brakes." He makes it safely back to the garage, with fire extinguishers getting to work and the fire is very quickly put out. That could've been a lot, lot worse. A lucky escape. What of Vettel? Still work in progress, I'm afraid. Loving your suggestions for the best looking F1 cars in history. Here are a couple more. It is a good start for Hamilton and Mercedes, who is six tenths faster than Bottas and it is a bad start for Vettel, who has damaged his car and is missing some running. A good day definitely for Hamilton. Forty minutes left of second practice and it is good news, bad news for Ferrari. Bad: Vettel's car is being worked on after he just went into the wall. The right front hit then the rear, Sebastian Vettel really did hit the wall quite hard. That was a reasonably big hit. A bit of fluid spilt out and that sounds like it is going to be a longer repair than just changing the wheels. There is quite a lot of debris coming from the right-hand side (of Vettel's Ferrari). The hypersoft tyres have some serious marking on it. There is fluid draining out all over the floor. That pink fluid is still dripping down the bottom of the car, there is a lot of hydraulic fluid coming out of it.